Image: Adam's old apartment's toy room, in the cantina diorama. I took this in 2009. Commentary: I consider BoShek to be the original gag figure, largely because I feel the joke was on me. I used to write a Q&A column over at Rebelscum in the late 1990s and early 2000s, and fans started writing in - regularly - asking about when BoShek might come out. My answers were typically some variation on "half past never" or "after Hell freezes over" or what have you, but since I was writing 3 10-question columns per week, I had to post something. It turns out that back then Hasbro was reading the column regularly, and when BoShek came up at a brand meeting (or so one version of this story goes) they said "Hey, there's this guy on the internet who keeps writing how we'll never make it, we should totally do it to see his head explode." (I've heard another version of this story that say "I don't know that you came up.") Regardless, a couple of years of me making fun of BoShek inadvertently created more awareness for a balding, no-line pale man in a black space suit. The least interesting man in the world has been rendered in plastic over some fairly fantastical alien creatures from one of the most influential scenes of one of the most world-changing movies ever made. There were never petitions for BoShek, but there were a lot of nasty columns from me to my readers about why anyone would ever want him after the mutton chop joke worse off. And I have him. You do realize this is one of many problems I carry around inside my person on a day to day basis. Complain as I will, even at the time of his release I couldn't deny that this was actually a pretty good action figure. Hasbro made it do everything it should be able to do, and then some. I was figuring we'd get an adequate figure who could stand up and maybe have a helmet or a drink, but Hasbro gave him a really ornate space helmet plus a unique gun which fits in a holster on his left hip. Also, his right hand was posed in such a way that it looks like he can carry around his helmet... or make a rather rude gesture. This figure was made using the same basic format for the era. Heck, he doesn't even have that much articulation - the standard six joints were augmented by a swiveling right arm bicep, and that's all you get. The quality of the sculpt was a little soft as well, especially when compared to the 2002 Cantina alien Djas Puhr which looked spectacular but felt less like a toy and, like much of the 2002 line, more of a collectible. While not a figure any kid would ever ask for, BoShek was a neat transitional piece between the end of Power of the Jedi, were you didn't really have to "be careful" with figures and you could just hand them to a kid and count on lightsabers generally not snapping or limbs generally not breaking off because the pegs were too skinny, or painted in place. Things worked pretty well up until this point, and from here on out Hasbro started to question the "toy" conceit. Heck, Eeth Koth from the previous wave was described by Hasbro as the future direction for the line with more of a statue pose, an aggressive stance, and a two-piece lightsaber which had a removable (breakable) blade. History judged the removable blade harshly, the subsequent magnetic features (which I thought were neat) were dropped by 2003, and action features - largely absent from Star Wars figures - began to creep into the line with more spring-loaded rockets and other gimmicks. Were I to begin collecting Star Wars toys today, I'd probably focus largely on Kenner and Hasbro's offerings from 1995-2002 and of course Kenner's range from 1978-1985. Even "hard to get" figures were easier to find than the bulk of today's newest releases. Collector's Notes: Depending on where you shopped, this figure was either fairly common or impossible to find. There was a Toys R Us near me that not only had a ton of these, but kept restocking them. It was paved over for yet another car dealership after closing around 2006. Back in 2001, Hasbro would sometimes do case mixes with 3-4 new characters at 4-3 units per case - and stuff sold through. There were few carry-forwards and the realty was that shortpacked Star Wars figures were fairly uncommon if you could wait a couple of months. You likely could find them. These mixes helped online stores to sell sets of waves, and it gave fans a bigger chance at actually finding stuff at retail. This practice was pretty much done away with completely by 2009 as Hasbro produced larger waves and they had a stronger desire to milk existing figures for additional runs. I don't blame them - Boba Fett and Darth Vader sell - but it kind of stings. 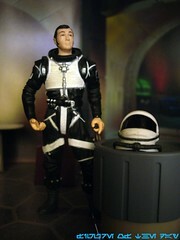 Today BoShek can be had for roughly his original issue price; he was always somewhat cheap on the secondary market. I saw a bunch of him sealed on the card at Goodwill a few months ago. Also, this is the last Star Wars Figure of the Day. Thank you for your kind indulgence. Thank you for having read the column these last few years and please keep enjoying Galactic Hunter and Q&A. If you'll excuse me, I need to go off and listen to a 50-minute version of "Louie, Louie."